With Ear Stretching more popular than ever, we have just took delivery of a huge stock of Acrylic Ear Plugs in sizes 6mm through to 25mm. The majority of the new designs are screw sets, this means that the front (or sometimes the back) of the plug screws off and is completley removable so that the ear plug can be fitted and positioned into the stretched ear lobe and the other section will then screw in place. This keeps the design sitting comfortably in place with minimum discomfort to the lobe during the changing process. 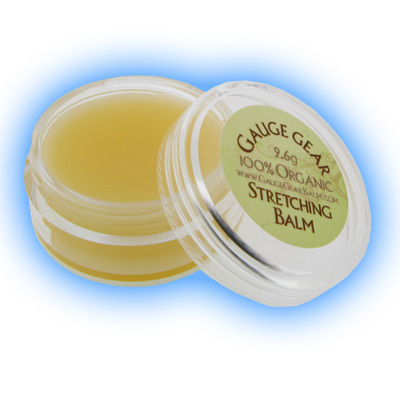 It is a balm which is 100% organic and contains natural ingredients to help keep your stretched lobes in great condition. Ingredients include Tea Tree Oil which is a natural antiseptic and helps to repair the skin, Jojoba Oil which is antibacterial and helps to promote cell growth, Sweet Almond Oil to reduce dryness and sooth any itches and Myrhh Oil which is Anti Fungal. It is only £5.99 in a handy little 9.6 gramme container which you can easily pop in your bag or even your pocket to carry around with you. We can't recommend this product highly enough. You can find our latest new products here and there is a link to some of the new designs on this page.